How should I pay for my college education? Is one type of financial aid better than the other? What do I need to do in order to apply for the right kind? These are just a few of the questions Peirce Financial Aid Specialist April Battle-Johnson answered at last night’s financial aid workshop, where students at all stages of their college career came to ask their toughest questions about paying for their education. In case you weren’t able to make it, we’re sharing some of the high points today. Grants, scholarships, and merit awards, which you don’t have to repay as long as you meet the criteria. Student loans and parent loans, which you do have to repay. The National Student Data System (NSLDS) is a centralized national database that stores information on federal grants and loans (not private loans) to help you keep track of your financial aid. It shows how much aid you’ve received, and displays your current enrollment status. You can also look up your loan servicer (the company responsible for collecting payment on your student loan). A major theme of the workshop was understanding how to borrow your student loans responsibly. After all, a student loan is just that -- a loan -- and you’ll have to pay it back, even if you didn’t like the education you received or you can’t find a job after you graduate. On top of that, many students don’t realize that you can only borrow between $5,500 and $12,500 per year for an undergraduate degree, depending on how many years you have attended college and your dependency status. 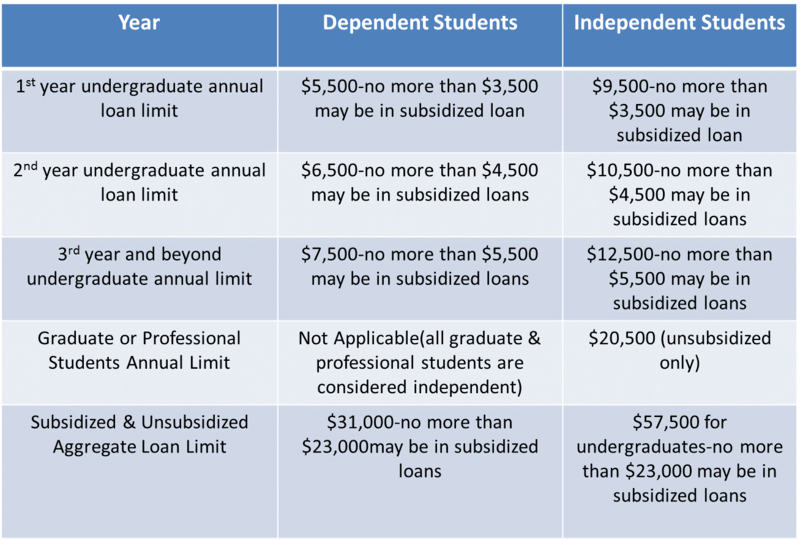 You are only allowed to borrow a lifetime maximum of $31,000 as a dependent student and $57,500 as an independent student for your undergraduate education, so if you reach that limit, it might impact your ability to finish your degree. If you intend to earn your degree part time, but take the full amount of funding available from your student loans each year, you could end up not having enough to help you throughout your entire time at college. We created this chart to help show loan amount eligibility. Make sure to reference it when borrowing for your student loans. Once you understand how to borrow responsibly, the first step in almost every student’s financial aid journey is to apply for the Free Application for Federal Student Aid (FAFSA). This government-issued application will help determine what financial aid you are eligible to receive. It considers factors such as your age, marital status, grade level, and whether or not you have children to determine whether you’re an independent or dependent student, which impacts your loan amount eligibility. The standard now is that you’re considered a dependent if you’re younger than 24 years old, unless you’re married, are an orphan or ward of the court, have children, have been in the military, or are homeless. If you’re a dependent student, you’re only allotted a certain amount of money to borrow. If it’s not enough to cover your educational costs, then one or both of your parents can take out a Parent Loan for Undergraduate students (PLUS) to help cover it, if they’re eligible. If a parent is not eligible for the parent loan, the Department of Education will loan a dependent student more money because the parent can’t help out. But a parent often has to be part of the process, even if the dependent student is trying to take care of their educational costs alone. You need to complete the FAFSA every year to intend to attend classes, and the deadline for submission is May 1. This deadline is also important if you are a Pennsylvania resident and might be eligible for the state grant. This is just the surface of the financial aid process, and you probably have many questions about your individual situation. The Office of Financial Aid is always open to answer questions and offer support. Email us at Financialaid@peirce.edu to ask a question, set up an appointment (although these are not required) and speak with your Financial Aid Specialist today. We’ll announce dates, times, and room locations for each workshop on the blog, as we get closer to each event, so make sure check back frequently!